Lenoir, North Carolina (December 10, 2017 – 1:30 pm) – Blue Ridge Energy line technicians and assisting crews have all power restored for the electric cooperative’s members impacted by heavy snow that began Friday afternoon. Most of the damaged power lines and broken poles were the result of heavy, wet snow falling from trees and limbs or bringing them down in the process, damaging the electric system. In some locations where limbs and trees were not involved, the falling snow was heavy enough on power lines to “slap” the lines together, causing blown fuses and resulting outages. Repairs and restoration times varied due to the extent of damage in each of 472 damaged locations of the power system line crews repaired or replaced. At the height of the outage on Saturday, 5,200 members were without power. 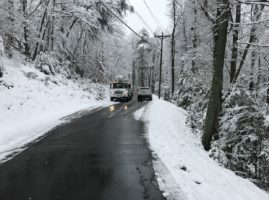 The most significant damage and extended outages were in Caldwell County, where falling snow, limbs and trees onto power lines continued throughout the weekend. Blue Ridge Energy expresses deep appreciation for all the line technicians and personnel who worked to restore to power as quickly and safely as possible! This includes assisting crews sent by sister cooperatives and contractors: South River EMC, Union Power Cooperative, Central Electric Membership Corporation and Sumter Utilities. For more information on storm and outage preparedness, as well as to view an online outage map, visit www.BlueRidgeEnergy.com.